Donald Trump spoke often during the presidential campaign of his intention to “drain the swamp” – that is, to clean up the corruption, influence, and cronyism that is too prevalent in Washington. Unfortunately, the first 100 days of the Trump administration has had precisely the opposite effect, bringing in conflicts of interest and ethical and legal problems on a massive scale not seen since at least President Nixon and perhaps ever. At the core of these problems is President Trump’s decision not to divest from his vast business empire. President Trump controls an organization made up of hundreds of different companies in at least 20 countries. The Trump Organization operates hotels, buildings, golf resorts, and other businesses, and also sells the right to use the Trump name to brand properties and other businesses his companies do not own. Despite numerous bipartisan calls well before his inauguration for President Trump to follow the example of every modern president and sell his interests in these businesses, and in the face of warnings that failure to do so would give rise to intractable conflicts of interest, President Trump has refused to divest. As a result, the American people have no way of knowing whether key decisions in the areas of taxes, regulation, environmental policy, employment and housing discrimination, foreign policy, trade, and many others are being made in the best interest of the country or in President Trump’s own financial interest. And when these businesses receive payments or benefits from foreign or U.S. federal or state governments – as the evidence shows they do day in and day out – President Trump violates our fundamental anti-corruption laws: the Constitution’s foreign and domestic emoluments clauses. The tone set by President Trump’s unwillingness to curb his own massive conflicts of interest has reverberated through the federal government. Ethics issues confronted nearly all of President Trump’s major cabinet nominees, leading several, including Secretary of the Army nominee Vincent Viola, Secretary of Labor nominee Andrew Puzder, prospective Secretary of the Navy nominee Philip Bilden, and Deputy Secretary of Commerce nominee Todd Ricketts to drop out before even receiving a confirmation hearing. Ethics issues contributed to fierce confirmation battles for others, notwithstanding the President’s party’s majority in the Senate, including Secretary of Education Betsy DeVos, Secretary of Commerce Wilbur Ross, and Secretary of State Rex Tillerson, among others. In some cases, even where a nominee was confirmed, conflicts of interest and ethics issues followed them into office, forcing recusals from participating in significant agency work or, if they do participate, risking the legal validity of that work. For example, Attorney General Jeff Sessions and Administrator of the Environmental Protection Agency Scott Pruitt have already announced significant recusals, although even these recusals may not go far enough in some cases. Complying with ethics rules also has presented difficulties outside the confirmation process for White House and other executive branch officials, leading to complaints, discipline, and a firing. Director of Strategic Initiatives Chris Liddell appears to have run afoul of the federal criminal conflict of interest statute by attending and possibly organizing at least three meetings between President Trump and business executives from companies in which he held millions of dollars in stock. Nepotism issues have also arisen with President Trump’s hiring of his daughter and son-in-law, Ivanka Trump and Jared Kushner. High-profile White House and executive branch employees have also improperly used their official positions within the first 100 days; in two cases, this was to endorse products, with Counselor to the President Kellyanne Conway endorsing Ivanka Trump’s clothing line on national television and Secretary of the Treasury Steven Mnuchin advising viewers of a live online interview to take their children to see Lego Batman, a movie he executive produced. In another case, a White House official appeared to improperly use his official position for politics, in violation of the Hatch Act, when Director of Social Media Dan Scavino, Jr. urged his Twitter followers to defeat a member of Congress who opposed President Trump’s healthcare legislation from an effectively official account. At least one White House official appears to have already violated the ethics pledge each official signs upon being hired — Chief Strategist and Senior Counselor to the President Stephen Bannon reportedly communicated repeatedly with his most recent former employer, Breitbart News Network, about official matters. National security advisor Michael Flynn resigned after only 24 days on the job after having improper conversations about sanctions with Russian officials during the presidential transition period; afterwards, it was revealed that he had also failed to disclose at least $68,000 in income from Russian-related organizations on his initial financial disclosure form. Outside individuals advising President Trump have also faced serious ethics questions. For example, billionaire investor Carl Icahn has been named a special advisor for overhauling the country’s regulatory framework, and has reportedly advised President Trump on relevant personnel and policies, including the head of the Environmental Protection Agency and an existing regulation requiring fuel companies to use certain amounts of biofuel. It has been reported that one of Icahn’s companies would have saved more than $200 million in costs last year if his suggested change to the biofuel regulation had been in place; as an outside advisor, however, Icahn has asserted he is not required to follow government ethics rules that would ensure his advice is understood in its proper context. Administration officials also appear to have failed to comply with basic transparency obligations, such as the legal requirements to maintain presidential records and to properly document who outside the government is advising President Trump. With respect to presidential records, issues include the use of phone apps that automatically delete messages, improper deletion of records such as tweets, and the possible use of private email accounts without proper record-keeping. The issues of transparency relating to who is advising the president include apparent failures to comply with the Federal Advisory Committee Act, which requires basic information be kept and released about any advisory group that includes people outside the government; President Trump has used such groups on matters such as filling a Supreme Court vacancy and setting policy relating to manufacturing sector jobs. President Trump has also rolled back one of his predecessor’s major transparency initiatives, releasing White House visitor logs. Even what little the administration claims to have done to drain the swamp has proved to be more illusory than real. President Trump’s ethics executive order included a five-year lobbying ban after leaving the administration, but it intentionally left out the previous ban on lobbyists working at government agencies they recently lobbied. As a result, lobbyists quickly have been hired at several agencies. And less than 100 days in, the administration has already granted at least one waiver of the five-year ban. At the same time, any progress on reducing special interest influence has been undercut by President Trump’s own former campaign aides setting up shop as lobbyists with access to the president. Compounding these problems, the agencies that oversee and monitor government ethics have come under fire during this period. The Trump administration and its supporters sought to discredit the Office of Government Ethics after its director said publicly that President Trump should divest from his businesses, as other modern presidents had. In addition, even before inauguration day, House Republicans sought to gut their own watchdog, the Office of Congressional Ethics, in a secret vote announced only hours before; an unprecedented public outcry forced them to abandon this plan. 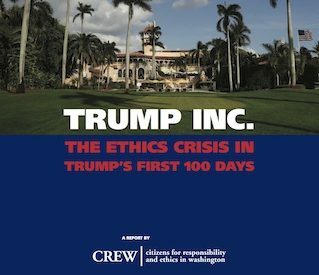 Far from draining the swamp, the first 100 days of the Trump administration have illustrated the importance of prioritizing ethics when entering public service – and the negative consequences when a president fails to do so. This failure of leadership resounds through the administration and the government as a whole, and ultimately harms our democracy and the interests of the American people. These lessons should be learned now, before more damage is done. Ignoring the Wall Between Government and Business – Eric Trump and Donald Trump, Jr.